Key Difference: Gyroscope is used for the measurement of angular rotational velocity whereas the accelerometer is able to measure linear acceleration of movement. 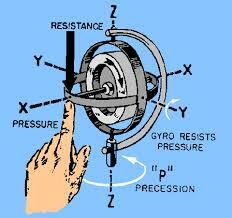 A gyroscope is an apparatus which is used to measure or maintain orientation. It works on the principles of conservation of angular momentum. It refers to any of the disc shaped apparatus or device which exhibits a gyroscopic behavior. Gyroscopic refers to a type of spatial mechanism. It consists of a rotating wheel which is mounted in such a way that its axis is free to take any orientation. Its central wheel is mounted in a framework of rings or gimbals. These gimbals are further supported on a spindle at one end, which is again mounted on a base. It works in such a way that when it spins, still it tries to retain its position. It depicts the resistance for any movement. The spinning motion gets faster and equally it becomes difficult to deflect the gyro. 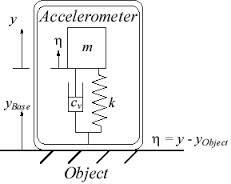 Accelerometer is a device used for the measurement of acceleration forces. Acceleration is basically the rate of change of velocity with respect to time. There are different types of accelerometers based on the sensing element and the principles of their operations. It has been designed for measuring non gravitational acceleration. Microscopic crystals of accelerometer take notice of every vibration associated with the velocity. It generates a voltage to create the reading on any acceleration. Most of the accelerometers are basically the Micro Electro Mechanical Sensors. It is used in mobile phones for determining the phone’s orientation. Theyy must be turned off when not being used, as they consume a lot of energy. Therefore, accelerometer can measure the acceleration of the device in context to the different dimensions, whereas gyroscope can measure orientation (rate of rotation)in different dimension. It is important to mention that in practice, accelerometer is only able to measure the directional movement. However, the lateral orientation or tilt is detected by using a gyroscope. Measures angular rate (speed of rotation).